We occasionally get asked how to check out from the store without having a PayPal account. The good news is that we’re here to help; here’s a step-by-step guide to paying with either a Direct Bank Transfer or with your debit/credit card without a PayPal account. You’re done – thank you! If you want to use your internet banking (or branch bank) to pay us directly then we have a Direct Bank Transfer option. In this option you will receive an order confirmation email with our bank details. You’ll then need to pay our bank with your order total amount before we can ship you your order. 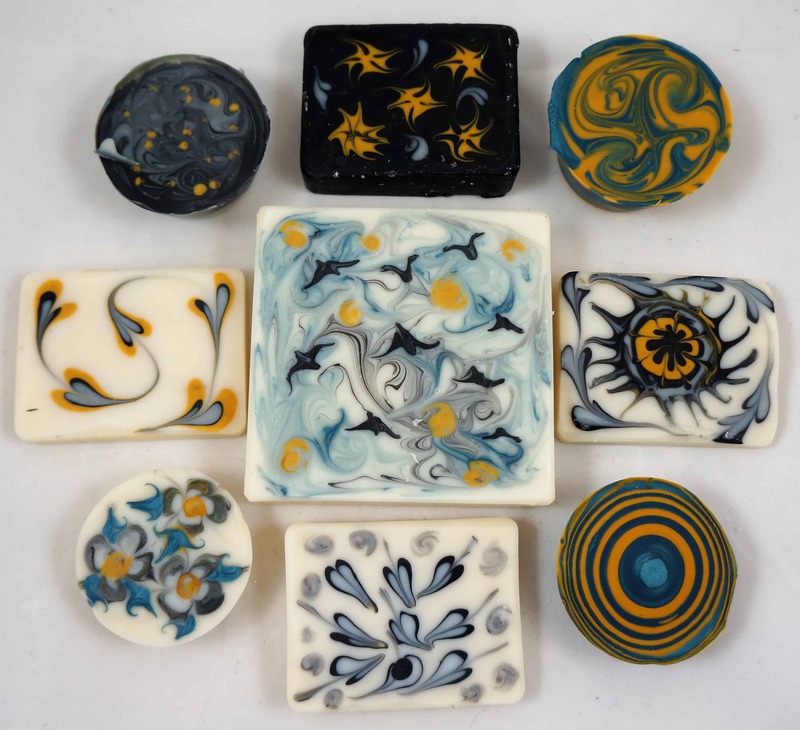 For those of you who haven’t already guessed, I am really into my soapmaking! 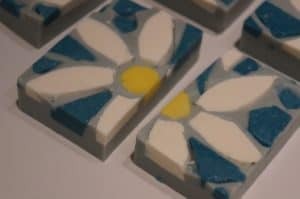 I have been a member of an american online soapmaking forum for several years and for the last year or so I have been helping to host soap challenges for the other members. A few times a year I make a challenge video demonstrating a technique for the other users to try. 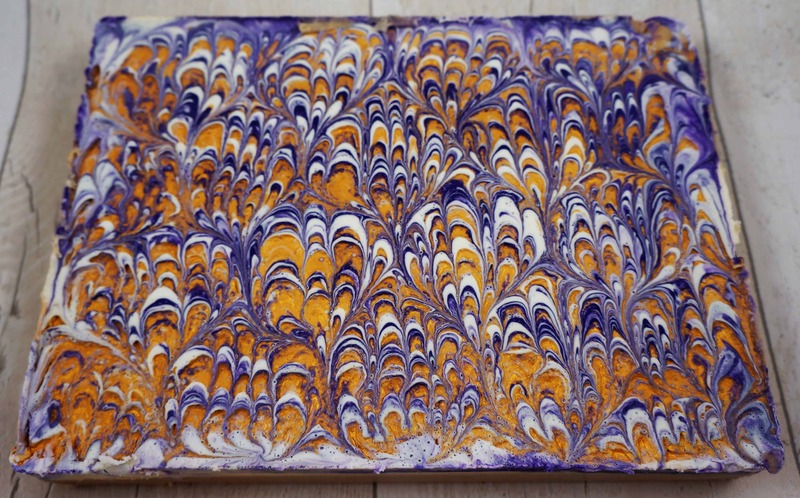 This month I have chosen peacock swirls and you can see my tutorial in the video below. I chose to make a beer soap using Tribute ale from the local brewery at St Austell and matched my swirl colours with the branding on the beer bottle. If you are ever down in Cornwall I would recommend a visit to the brewery, it was a really nice day out and our guide was really friendly. 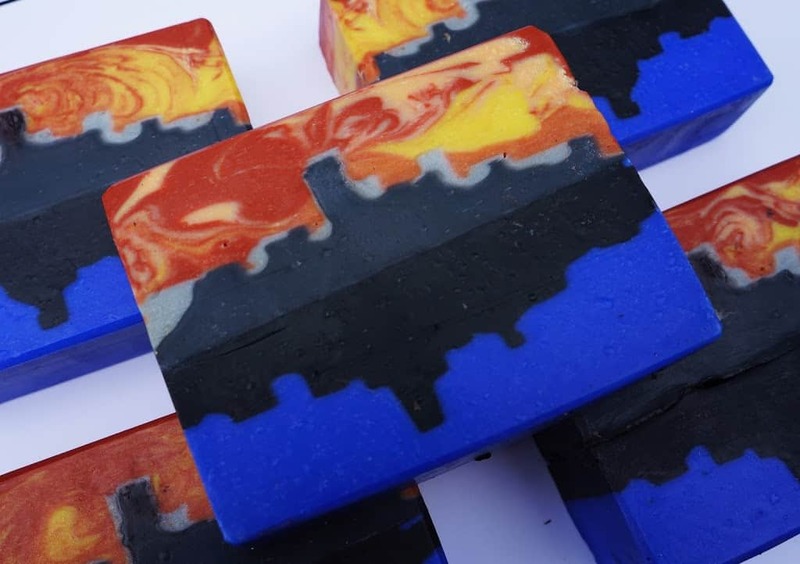 I love to take part in soap challenges as it allows me to really express my creativity and at the same time enhance my soapmaking skills. I don’t get much chance to do this within my business as I have to stick to my strictly regulated cosmetically certified recipes for the soap I sell via my website. 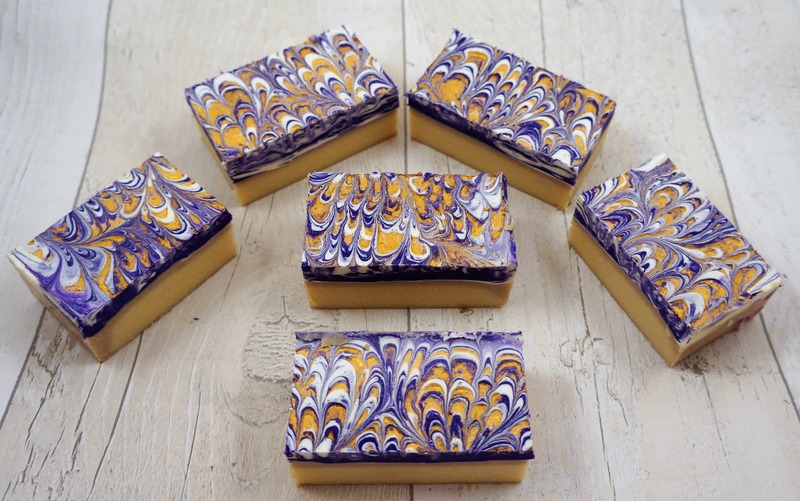 This month’s challenge required you to find a friend or family member to make soap with, who you don’t normally work with. 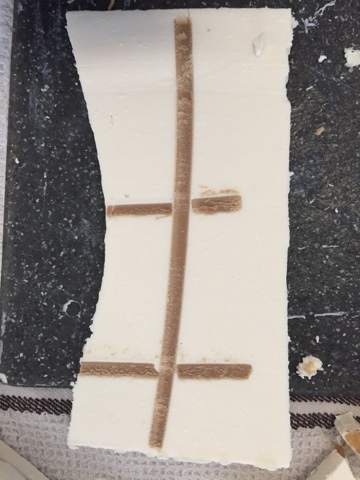 I asked my friend Anna as she was really keen to make soap and had tried on her own previously but was unhappy with the resulting soap. 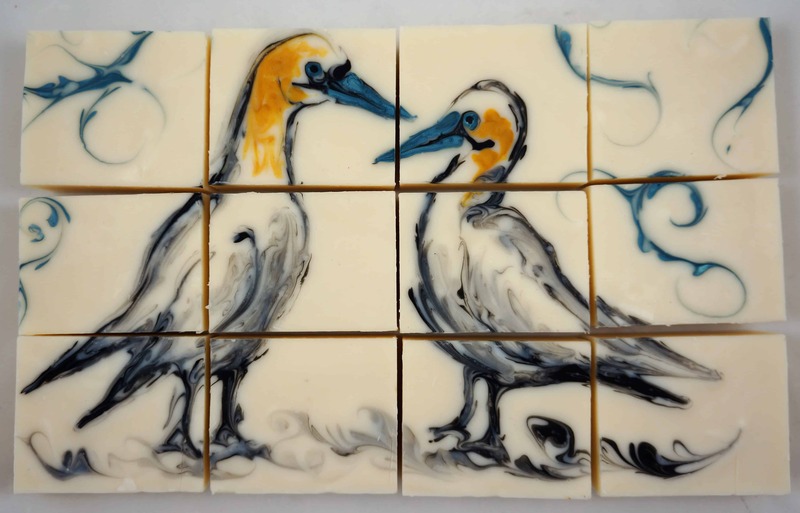 When I asked Anna what kind of soap she would like to make, she asked if it was possible to recreate one of her gannet drawings within the soap. 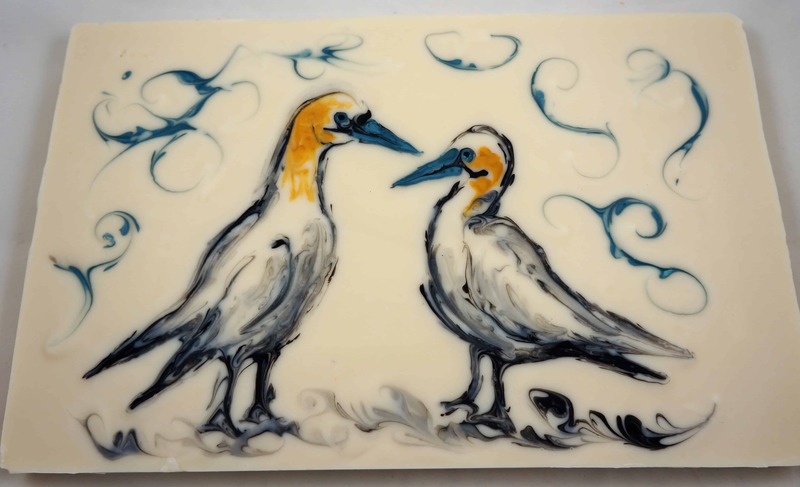 Anna originally wanted to embed the design within the soap log, but we only had a single day to work together so I advised her that an ebru style soap would work better and allow her more freedom of design. I thought her painting skills would really work with this style. 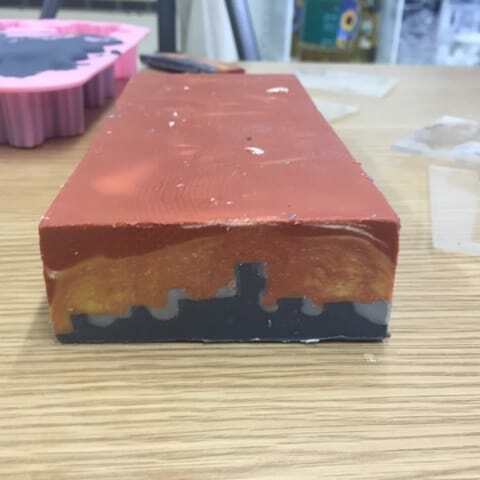 We made a white soap base in the bottom of the mould and I suggested scenting it with a marine fragrance called sea spray as it went well with the overall soap theme. We allowed it to set, and then poured a thin layer of soap batter on top (about 50mm thick). 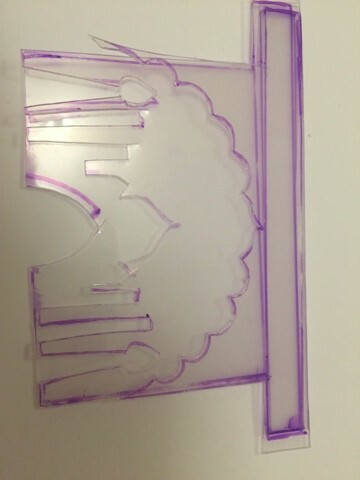 As you’ll see in the video below, Anna then created her design in this top layer using plastic pipettes and wooden skewers. The design was coloured using yellow iron oxide, activated charcoal and blue mica. 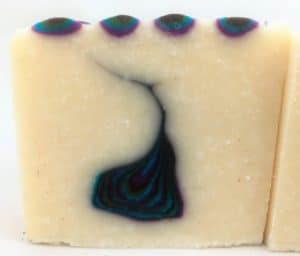 The soap recipe was a mix of palm, coconut, olive and sunflower oils with a superfat of 5% using 40% lye concentration. As the challenge was all about collaboration, I thought it would be great to show what we’d each done to make the final product. I’ve made sections of the video go quickly so you get the essence of our day together without having to sit through hours of video! 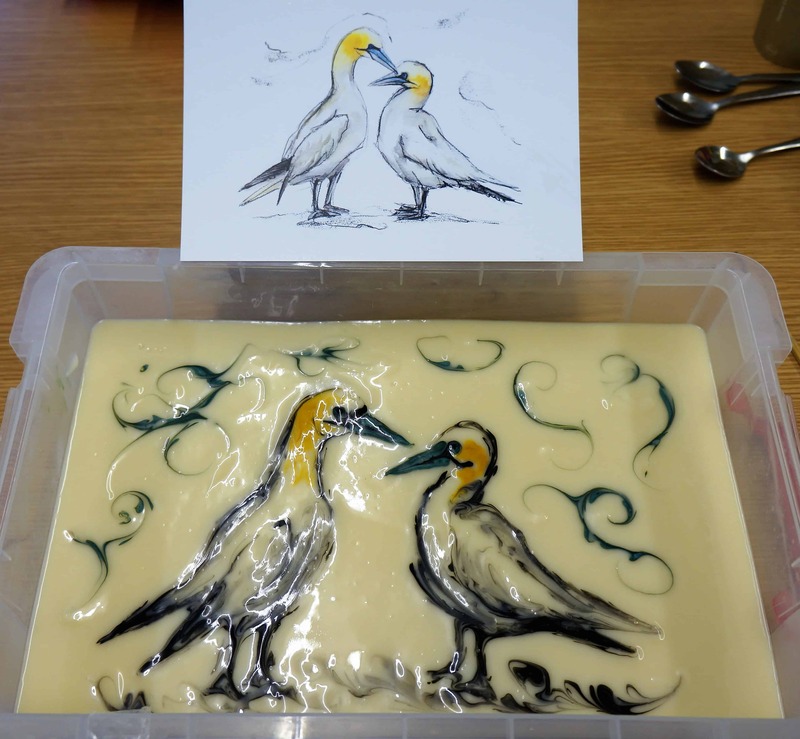 After Anna had created her gannet design, we both took the leftover soap batter and created some more little soaps in some silicone moulds. Thanks to Amy for coming up with this challenge, I really enjoyed working with Anna as I usually have to work on my own, it was so much fun and I would love to do it again. This is my new blog platform attached to my shiny new website. I hope you like it! For those of you who already follow me over on blogspot, I will be posting on here instead from now on. 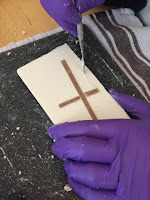 If you are a new reader, then please feel free to pop over to the old blog at http://thesaponista.blogspot.co.uk/ where you will find some tutorials which may be of interest if you are a soapmaker and some posts showing examples of my soap art. This is designed to be a place for me to show you the art based soap work that I do and provide information to those of you wishing to have a go at making soap yourself. Occasionally, I will be offering you the chance to purchase these extremely limited edition designs in my online store. However, as my company is based in Europe, we have very tight regulations regarding the sale of cosmetics, and every bar that is made has to be certified by a cosmetic chemist at an extortionate fee before they can be listed for sale. 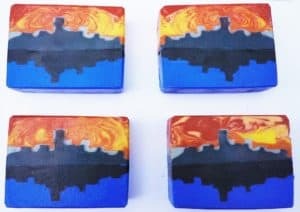 This means that unlike some of my other soapmaking friends across the globe, I am unable to share every one of my unique artistic designs with you. This month it is my turn to run the SMF soap challenge. 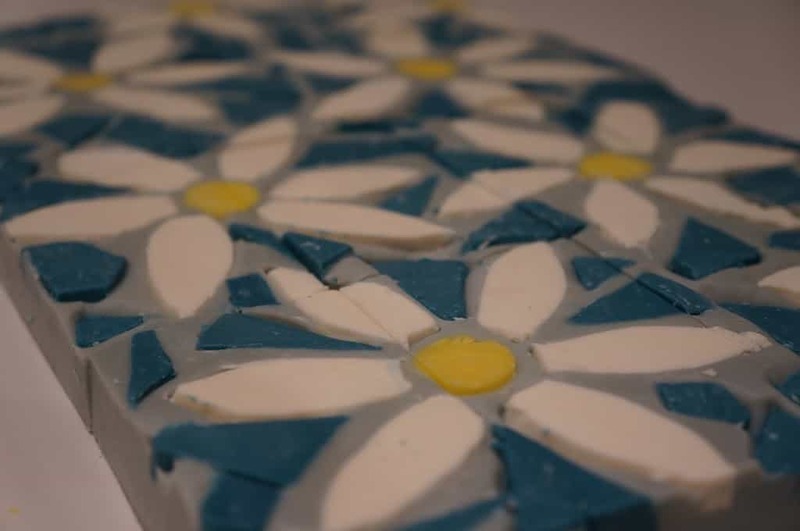 I chose the topic of mosaic soaps as I haven’t seen it done for a while and I like the versatility of the technique. I can’t wait to see what all the soapers who choose to participate will come up with! I absolutely love seeing all the creativity and talent from the soapers we have on the forum. Here is the mosaic soap I made for the demonstration of the technique. Once the challenge is over at the end of the month, I will add a link to the entries and the winner. Feel free to pop over to the forum, we are a friendly bunch and if you participate on the threads for a while then you will be able to enter the competitions. 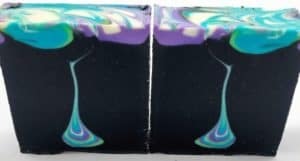 This month, the challenge on www.soapmakingforum.com was a tough one for me. 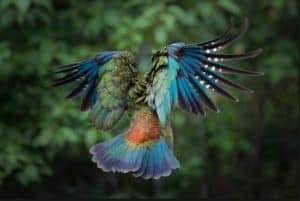 Were given several images of birds to look at and asked to choose one that stood out to us. 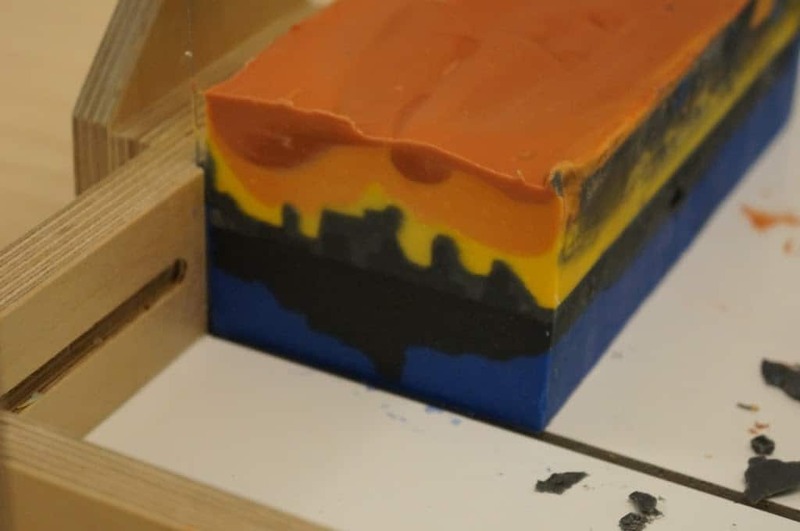 Then using colours from the photo, we had to take a feature or a feeling or something about the picture that struck us and translate it into our soap design. The bird picture I have used is the one that most appealed to me. I love the colours of the birds feathers combined with the green background of the leaves. 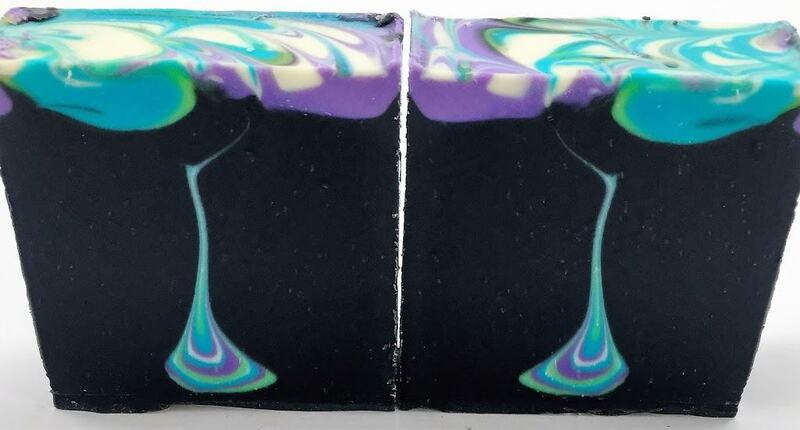 The colours I chose for my soap were a green from the background of the image and a couple of shades of blue from the feathers combined with the black and white which are also colours from the feathers. I love the way the birds feathers are splayed open and the image gives a feeling of complete freedom. 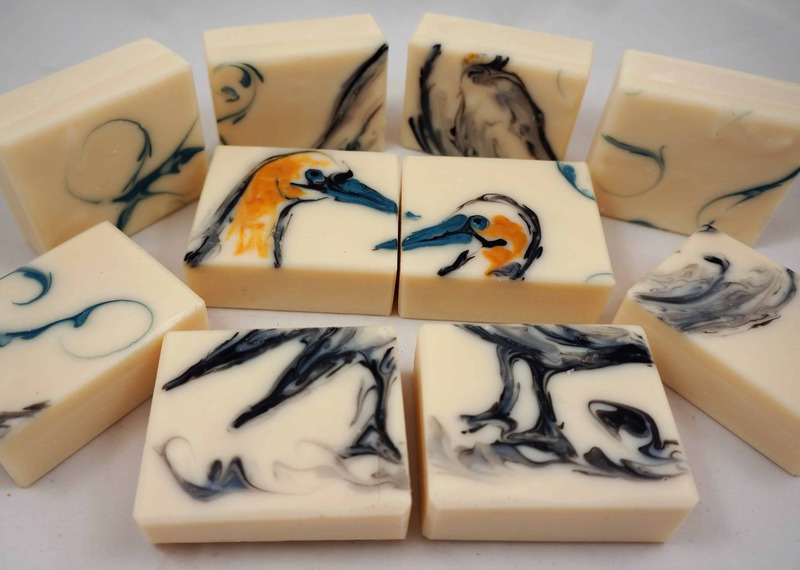 I have tried to reflect the lines of the long wing feathers in my soap design. I made it in a square soap mould, by placing dividers into the corners and filling with the different shades of color, then I filled the rest of the mould with the green and used a skewer to create the lines. 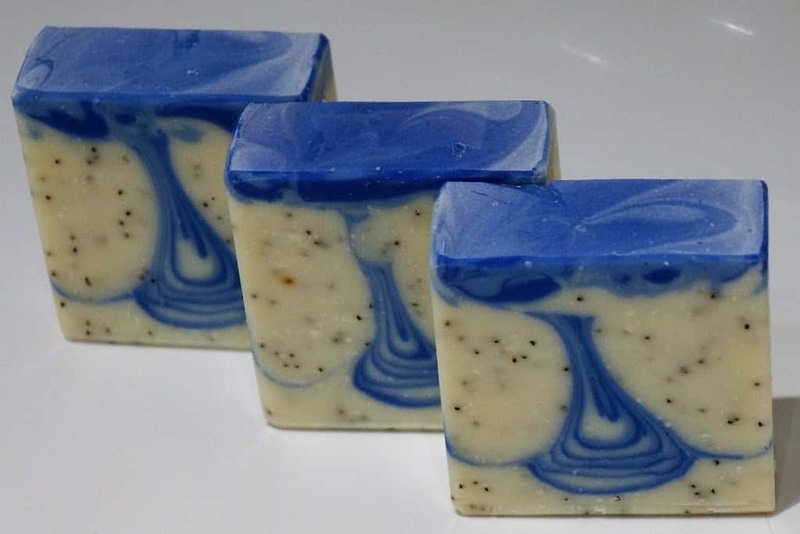 My soap is scented with a mixture of pine and cedarwood essential oils with a touch of juniper as I felt it went well with the overall look and feel of the soap. 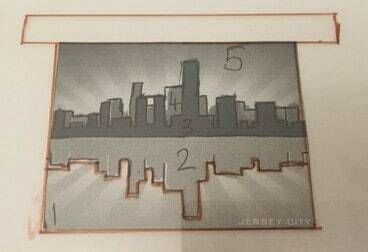 Here is the finished design, I hope you like it! This month’s challenge was incredibly challenging for me. I had so many goes at this trying to nail it, I think I will have enough soap to wash with for fifty years! I finally achieved a droplet that I am happy enough with to enter so here it is! 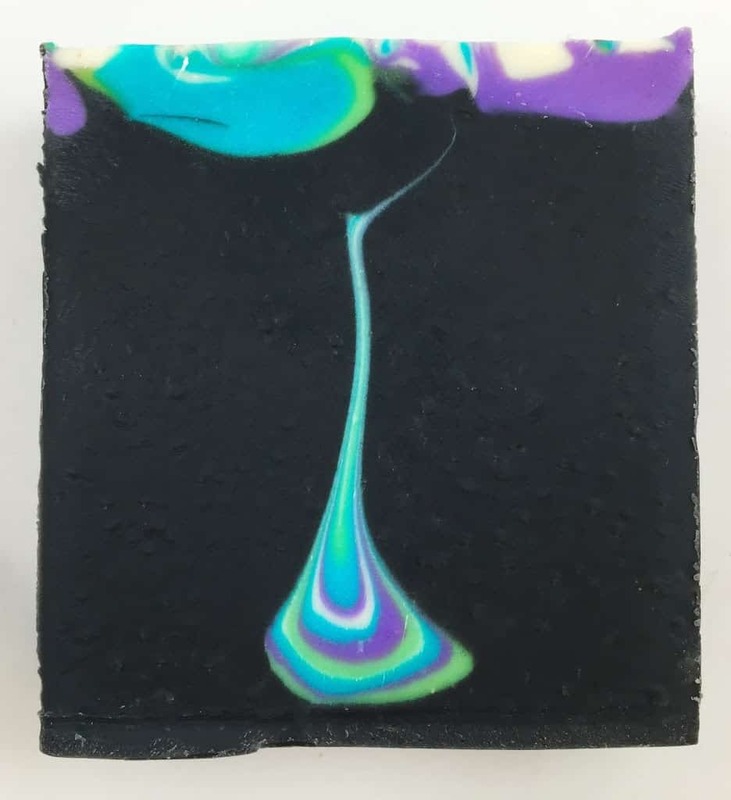 I only poured a small amount of batter into the bottom of the mould before pouring in my droplet colours as I like the droplets which have a long thin stem. My bars are scented with a blend of spearmint, lavender and rosemary essential oils hence the mica colours that were chosen. 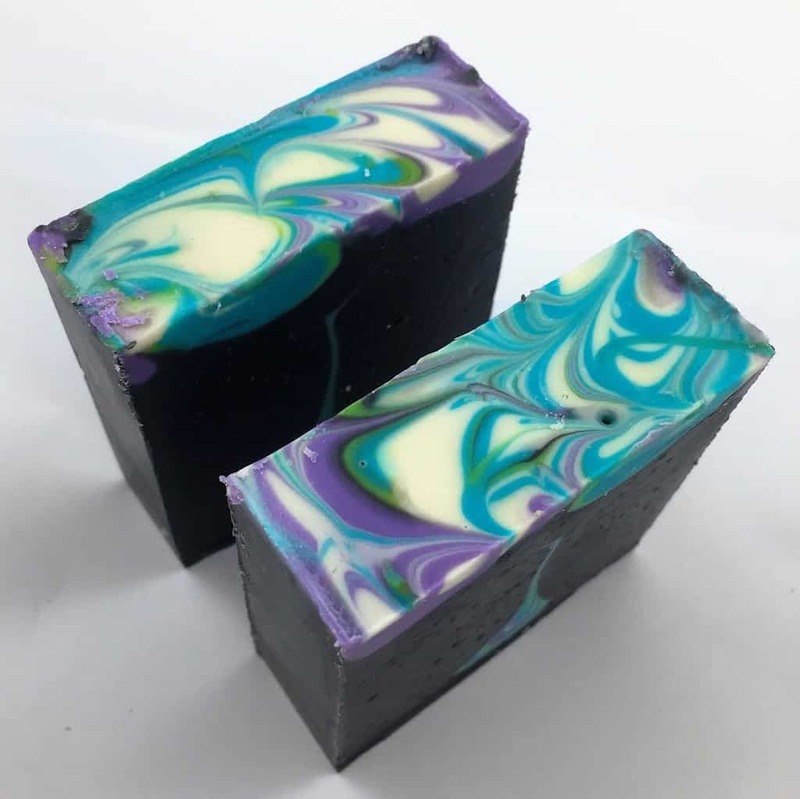 The mica was purchased from http://www.u-makeitup.com/ and the colours used were purple passion, lime, dreamy aquamarine and some titanium dioxide and activated charcoal for the black. I thought I would also post some of my other attempts in order to show you how challenging I found this challenge to be. Getting a droplet shape was not easy for me! I loved the colour of these and all the layers within the droplet, In real life they look much brighter and more vibrant. 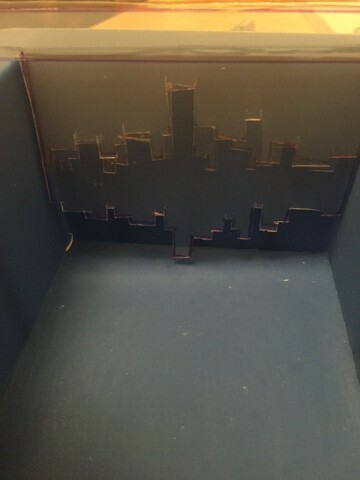 I was gutted that the outline turned out wobbly. I think it was because I poured the sides with a squeeze bottle rather than a jug so the pressure forced the batter into the mould unevenly. 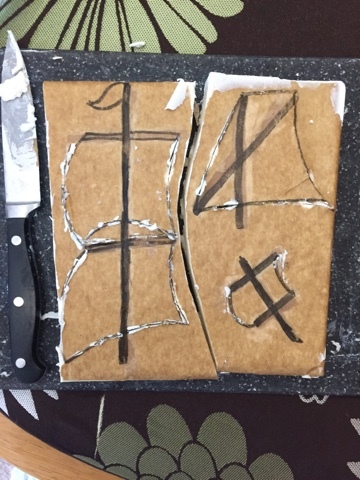 I was also disappointed that this attempt wasn’t a better shape. 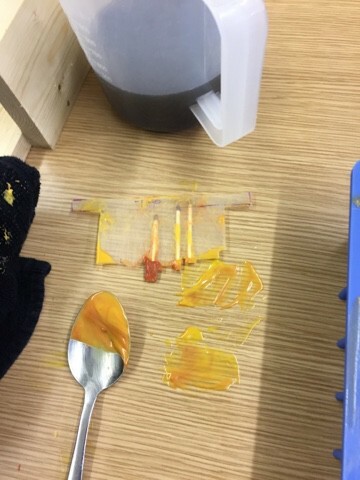 I allowed the central batter to touch the sides which resulted in the teardop having a line underneath it. 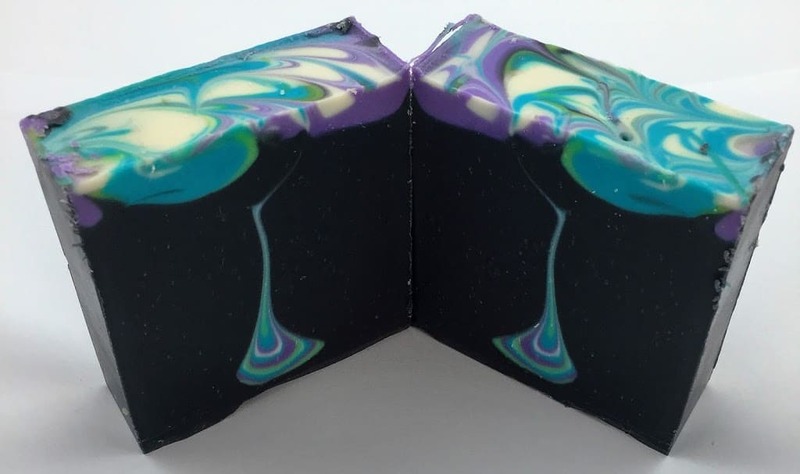 There were also lots of other attempts, some with no droplet at all, others with triangular shaped patterns and one where I used an accelerating fragrance which set up on me so fast that all I got was tiger stripes across the middle of the bar. And here as promised are my other six attempts!!! 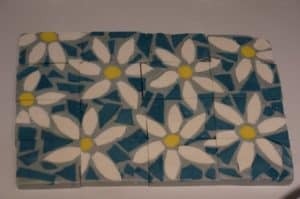 It’s been a while since I last entered the great cake’s challenge as I have been busy getting my little soap company off the ground. But when I saw the challenge this month, I jumped at the chance to have a go. I love the themed challenges and this one really appealed to me. Here is my entry for this month’s challenge. It is the Mayflower, the ship that the Pilgrim Fathers sailed across the ocean in searching for the new world. They departed from Plymouth on the 16th September 1620. My favourite drink, Plymouth Gin has an image of the ship on the bottle, so it is one of the first things I think of when I think of the city. We sometimes have tall ships stopping in the harbour and I love them, they are so beautiful. It is astounding to me that they made it over such isolated treacherous seas with people living aboard for months on end. I’m not sure it’s a journey I would be able to face myself! 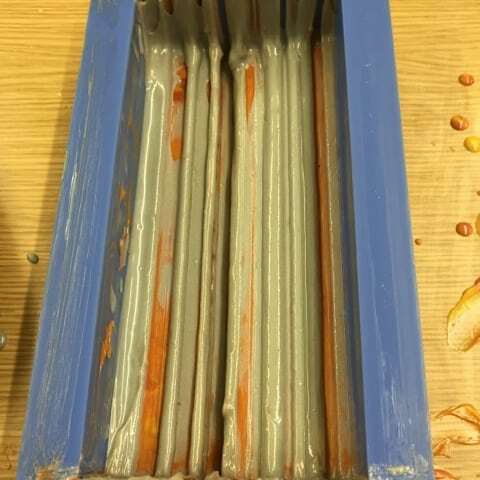 The soap is made in a slab mould using 100% cold process soap by making embeds then moulding more soap around them and cutting them again. 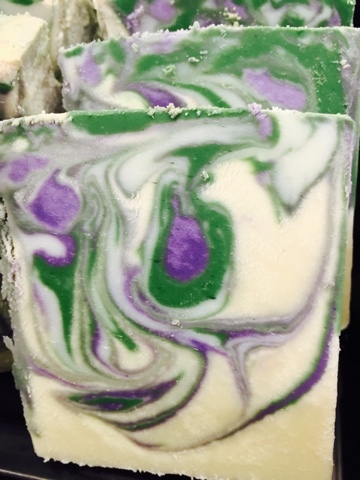 I used 40% lye concentration so the soap hardens up really quickly and can be cut within a few hours. 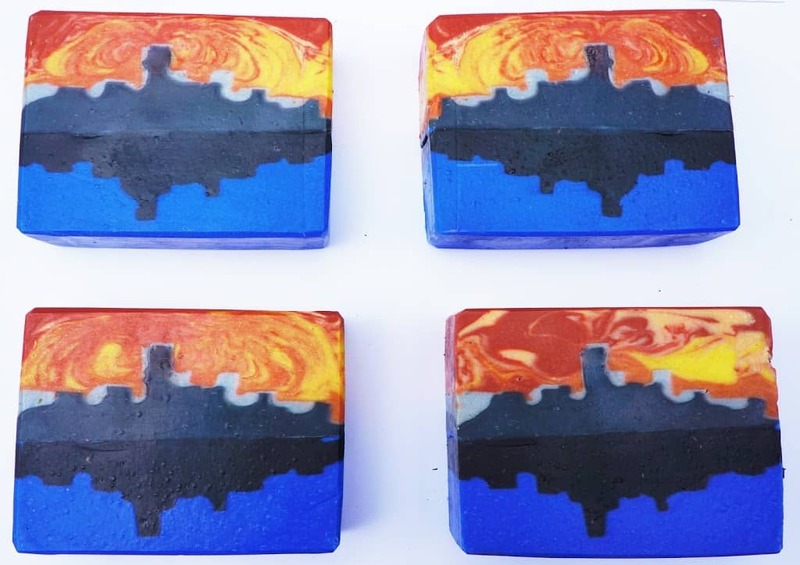 The soap is coloured with ultramarine blue, a touch of chromium green, titanium dioxide and the brown is chestnut mica, I scented just the base with Island Fresh fragrance which is a marine type fragrance, it accelerates so the embeds aren’t fragranced themselves. 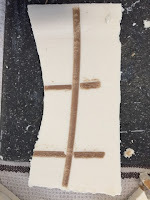 Then I drew the image of the sails onto some greaseproof baking paper and put it into the mould – I cut the brown soap into strips and put it into place over where I wanted it to stay. I held it in place with a dab of petroleum jelly. I then poured over white soap batter and allowed it to set. 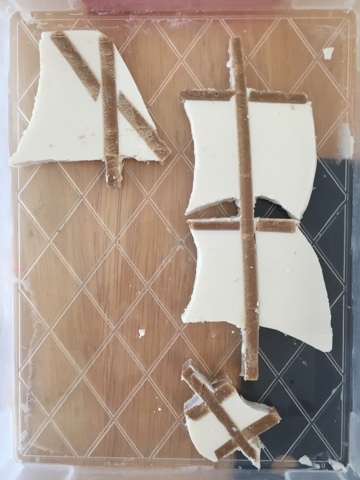 The next day, I used a small kitchen knife and some wax carving tools to cut out the sails. 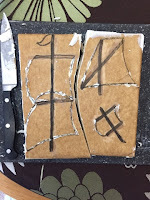 I used a wire cutter to cut the slab in half to reveal a sharper image from the inside of the embed so I had two mirror image versions of the sails. Partially in case anything went wrong so that I could have a second go, fortunately that wasn’t necessary! 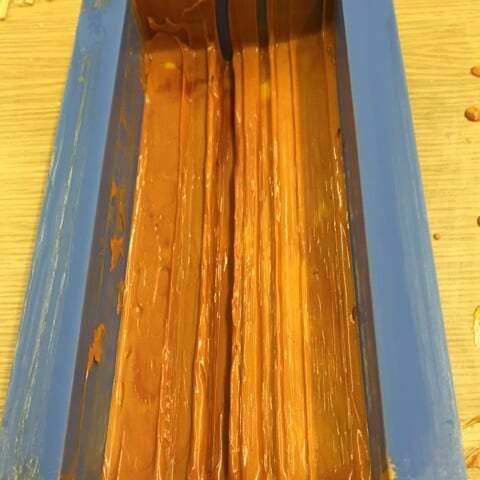 Then I poured the fragranced base into the final mould and allowed it to set until it was the consistency of pudding. 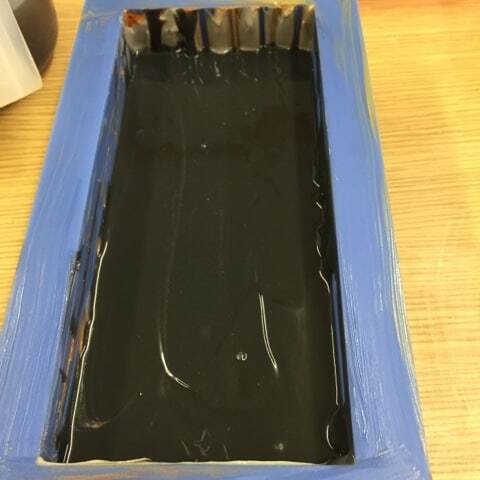 When the batter had set up enough that the embeds would stay in place, I poured the top layer. I added some extra embellishments to the ship in the form of windows. 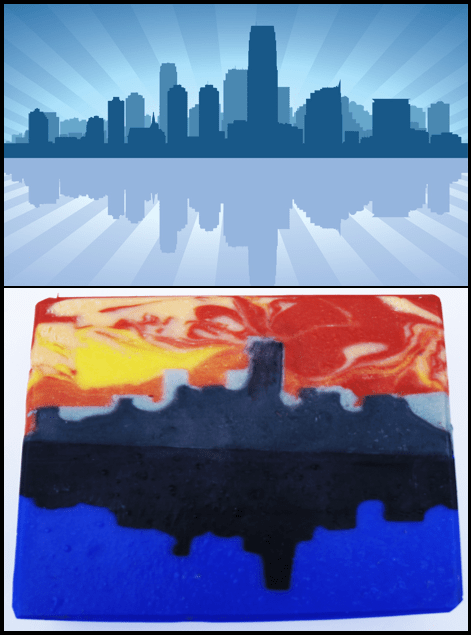 Added more blue batter to top up the soap so it was in line with the embeds and added clouds and waves to the sea. 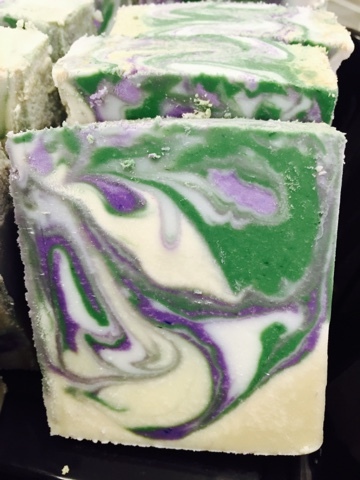 Here is the finished soap while it was still wet. 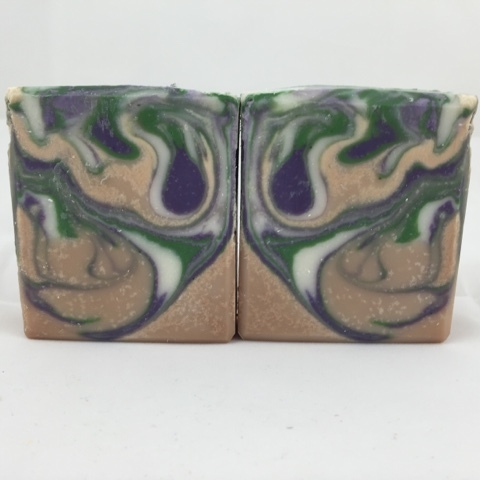 I really, really enjoyed making this soap and I hope you enjoy looking at it too. Thank you for organising the challenges Amy. 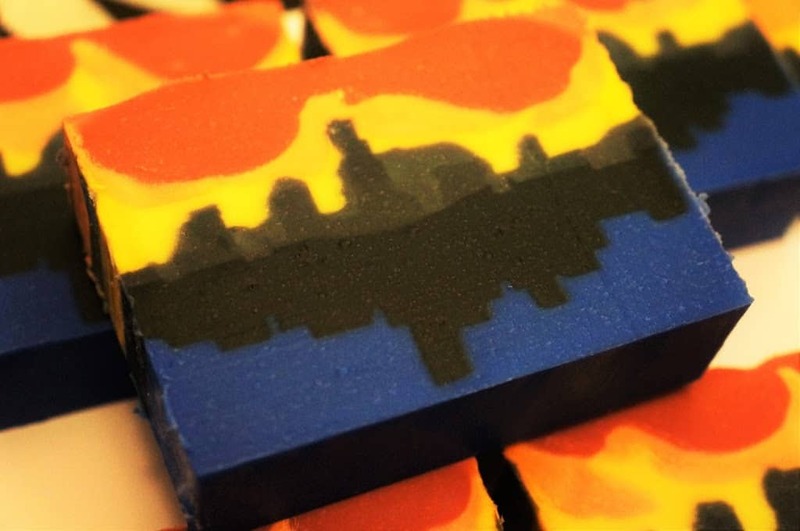 I would never have a reason to make soap like this if it wasn’t for you. 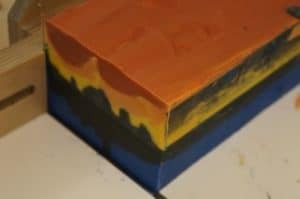 I help to organise a monthly challenge on www.soapmakingforum.com. I ran the August challenge which tackled inverted stamping. 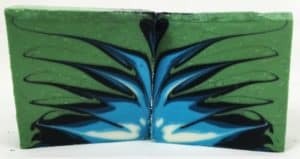 There is also an SMF challenge youtube channel with tutorial videos for all the challenges, including my inverted stamping one, along with other tutorials by SMF members that you may find useful. As long as you have been a member of the forum for a short period and have posted 50 times, then you can participate in the challenge. Come over and find us on SMF, we are a friendly bunch and always willing to accept new members into the fold. 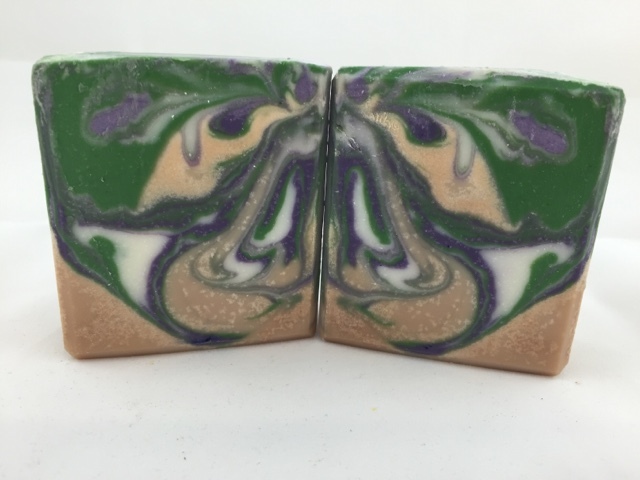 This month was a discolouring fragrance challenge run by GalaxyMLP, the basic rules of the challenge were to use a fragrance that discolours and incorporate that into your soap design. 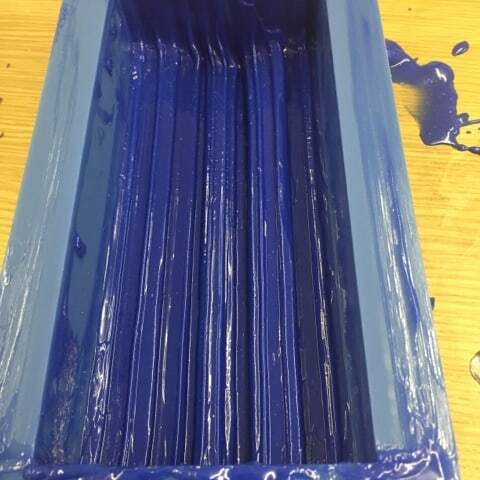 You also had to choose a colour scheme for a famous brand or sports team and incorporate that into your design too. 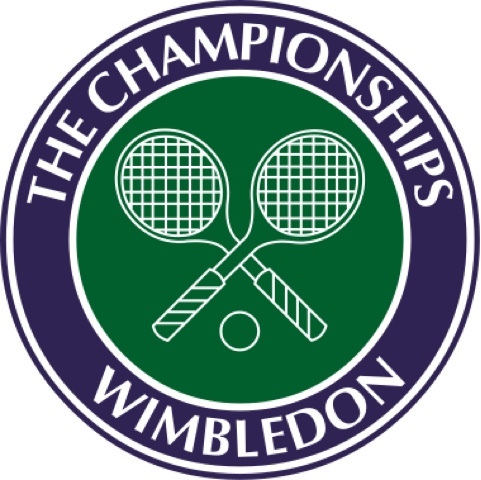 I chose to use Wimbledon as my theme as I love the combination of purple, green and white. The discolouring fragrance I used was porridge oats from gracefruit which I used at 3%. The description says it discolours to a dark tan. I wanted to try a sort of different butterfly swirl with this challenge. I tilted the mould slightly to one side, then filled it with 1/4 of the discoloured batter, then I alternately poured the white purple and green until the mould was half full. I then used a hanger in a circular motion to create the bottom half of the butterfly. Then I poured in some more discoloured batter and drop swirled the colours in on top to create the top wing of the butterfly. I hope you like it. If you are interested in the challenges please pop over to www.soapmakingforum.com and see what is going on this month.